(L-R) Laite, Cameri Masi, and Nacanieli part of the mangrove planting at Nakavika settlement. 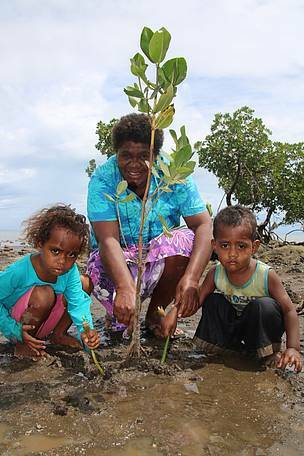 To protect their community from sea level rise and to safeguard their livelihood, the community of Nakavika, in the Ba Province, recently transplanted 600 mangrove seedlings. 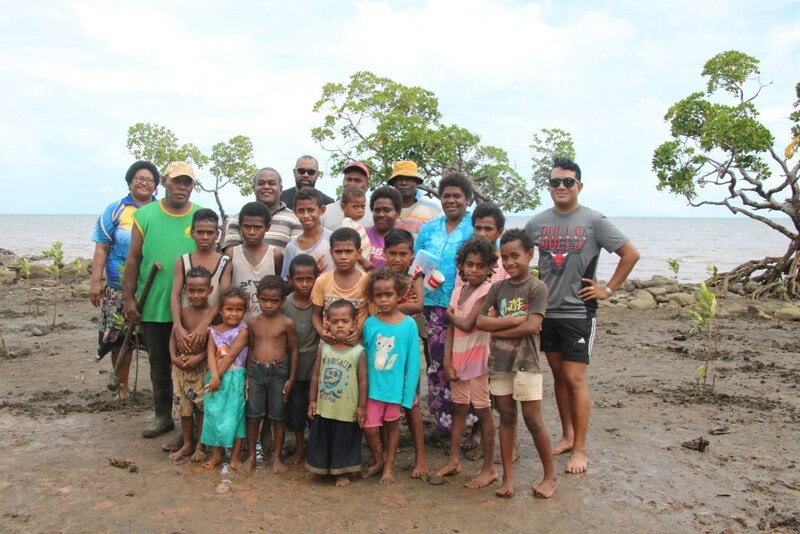 The planting activity which was carried out along Nakavika’s narrow and almost bare coastline included a good number of children and women participants. The mangrove transplanting activity was the first for all the participants with mangrove seedlings transplanted from Natutu village’s mangrove nursery. 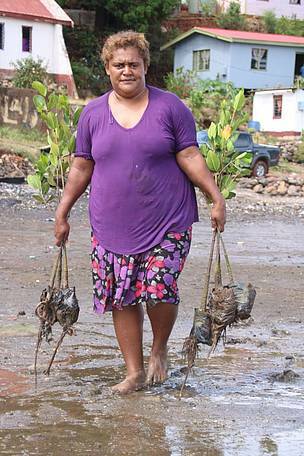 “It’s my first time and my children have also joined me, we are part of this because there are a few houses where the water reaches their front door steps during high tide and when there is heavy rain, so my children and I want to help these families who are affected,” highlighted Kaelesi Roela. “We are excited to take part this morning and happy to contribute in planting a few mangrove seedlings to try and protect our settlement’s coastline,” said Aumita Ravuga. Nakavika settlement has around 38 households with a population of 350 people. According to 55 year old Sailasa Navau, who has been a resident of Nakavika for the past 40 years, sea level rise became a reality for Nakavika, four years ago, when sea water started reaching the door steps of a few houses. 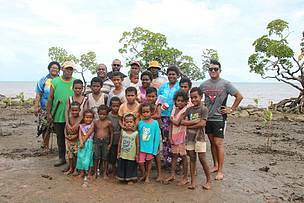 “In 2014, we started to see salt water reaching the door steps of some of the houses, we have been trying to get assistance and today is a good start but we need to transplant more mangrove seedlings as there are only a few mangroves standing,” added Navau. According to Isaia Usa, Nakavika settlement’s headman, the plan now is to plant as many mangroves possible. 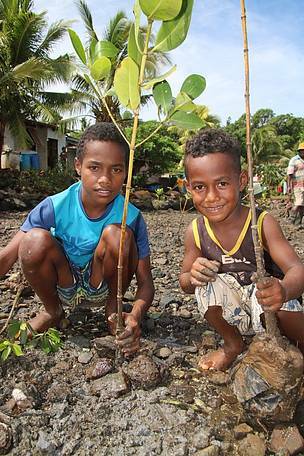 “The current mangroves standing, have been there for a number of years, however, we need to plant more to also protect our livelihood as the fish will come back but today is a good start and it is good to see the community excited of wanting to contribute to saving our settlement, we are also grateful to WWF-Pacific for the assistance,” Usa said. The mangrove seedling transplanting initiative is one of the rehabilitation efforts; WWF-Pacific has and continues to undertake with communities in the districts of Nailaga, Nacula and Tavua over the next three years through its ‘Living with Change: Resilient Mangroves, Fisheries and People of Fiji and PNG’ or IKU project that is funded by the German Government. “Working with these communities, especially the men, women, youth and children of Nakavika settlement in replanting and restoring their mangroves along their village coastline is very rewarding and inspiring, these vulnerable communities are doing their part and WWF-Pacific is also committed to advocating for stronger national policies and legislations in place to better protect our mangrove ecosystems for the benefit of our grass-root communities and the future of our country,” said WWF-Pacific’s IKU Project Manager, Alfred Ralifo. WWF is part of the Global Mangrove Alliance partnership that was formed at the World Ocean Summit in 2017. The Global Mangrove Alliance is an initiative to increase mangrove habitats by 20% by 2030. According to a wetlands report carried out in 2008, mangroves in the Pacific cover an area of around 597,000 hectares. Fiji has around 42,000 ha of mangrove forest. The Global Mangrove Alliance target of 20% restoration means Fiji has to plant an additional 8,520 ha of mangroves by 2030. (L-R) Sailosi Masi and Sitiveni Saulei part of the mangrove planting at Nakavika settlement. A total of 600 mangrove seedlings were transplanted. 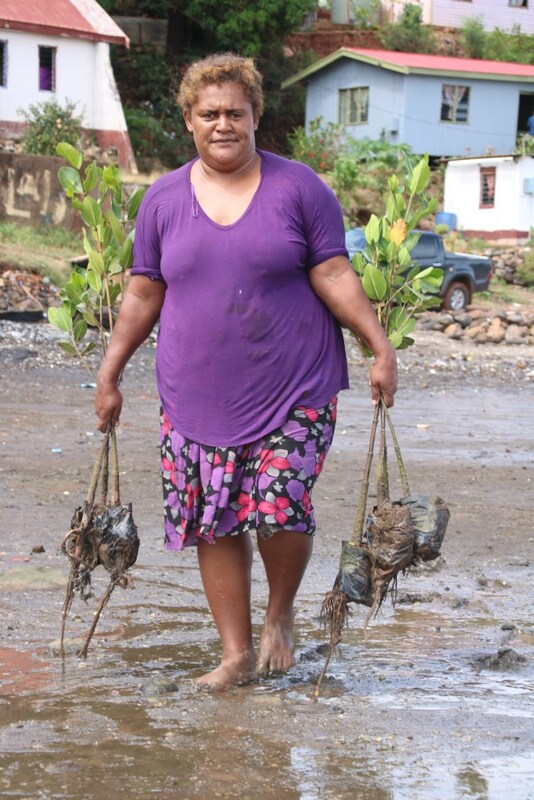 Kalesi Roela transporting mangroves for transplanting.